cAMP-dependent protein kinase regulates a number of cellular functions including gene expression, carbohydrate metabolism, Ca2+ homeostasis, and ion channel function. It is suitable for studying the phosphorylation of purified substrates and for use with cell extracts. Unlike the holoenzyme, the catalytic subunit does not require cAMP for activation. Recombinant PKA-Ca is produced from E. coli., purified from freshly extracted E. coli lysates, and purified to homogeneity using methods developed by LAE Biotechnology Co., LTD. The final fraction of PKA-Ca exhibits a single polypeptide band of 45 kDa. Recombinant PKA-Ca is supplied in liquid in 50 mM NaCl, 20 mM Tris-HCl, 1 mM EDTA, 10 mM 2-mercaptoethanol, 50% glycerol, pH7.5. at the dose of 100 KU per vail (Catalog # P020). One unit is defined as the amount of enzyme that will transfer 1.0 pmol of phosphate to Kemptide (LRRASLG) per minute at 30 C, pH 7.5. 50 mM Tris-HCl, 10 mM MgCl2, 200 mM ATP, pH 7.5. The recombinant PKA-Ca is shipped on dry ice and must be stored at -20 C or lower. Recommended long term storage -70 C; avoid repeated freeze/thaw cycles. 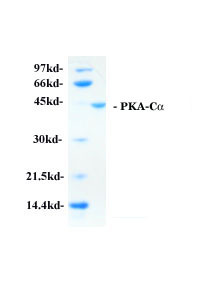 Recombinant PKA-Ca contains no detectable protease activity. Tests for DNase, Rnase, and phosphatase activities showed no detectable activity. 7. Slice, L.W., and Taylor, S.S. 1989. J. Biol. Chem. 264, 20940.